This gritty, dramatic tragedy western based on the novel, Guns of North Texas by Will Cook stars Joseph Cotten and the great Gordon Scott, formerly of five Tarzan movies and a slew of sword and sandal spectacles. He plays Lon Cordeen who, upon returning home after the end of the Civil War, discovers his father, Temple, carries a vendetta murdering any Yankees he comes across. Persisting that Lon join his brothers in their rampage, filial loyalty is strained till brother is pitted against brother. Franco Nero is on hand in his first western as Charlie Garvin who's in love with Temple's daughter, much to his chagrin. James Mitchum plays one of Lon's brothers, a docile man who's character becomes much darker after a terrible incident later in the film. Romano Puppo is also on hand as another Cordeen brother. Interestingly, Sergio Corbucci would direct the classic, The Hellbenders in 1967, a film which bears a passing resemblance to this picture even going so far as to cast Joseph Cotten in what is essentially the same role. While it looks more like a traditional American western, the level of violence leans towards the burgeoning European style of the day. With a cast of this magnitude and its dark tale of familial vengeance, it's one of the best early Euroaters. 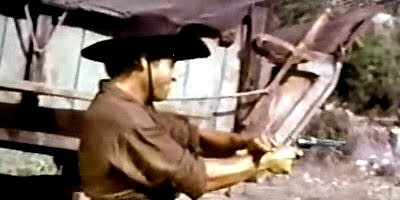 It's also worth seeking out to see Nero before redefining the genre with his mysterious coffin gunman in Django, 1966.